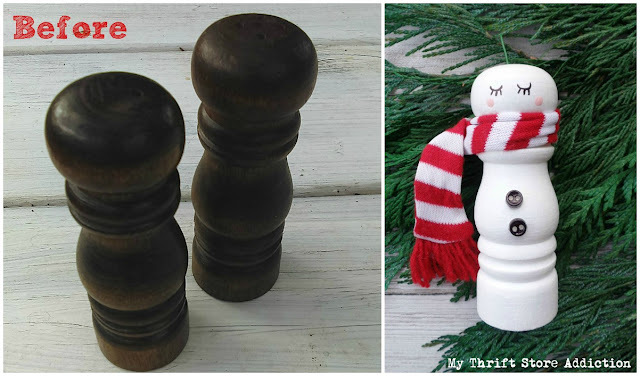 He's repurposed from a thrift store salt shaker! This is also the perfect project for "orphan shakers." This is the first time I've shared this project, and I haven't created a separate tutorial for it, but it's as easy as can be. First, paint the shakers white. Next, give your snowman a face. I used a Sharpie to draw the eye lashes, and the end of a paint brush dipped in pale pink craft paint to give it rosy cheeks. Last, dress your snowman--I found this miniature scarf at the thrift store, but a scrap of fabric would also work. If desired, glue on tiny buttons. I threaded the ornament hook through the openings in the top of the shaker for hanging, but he would be adorable in a Christmas vignette, too. 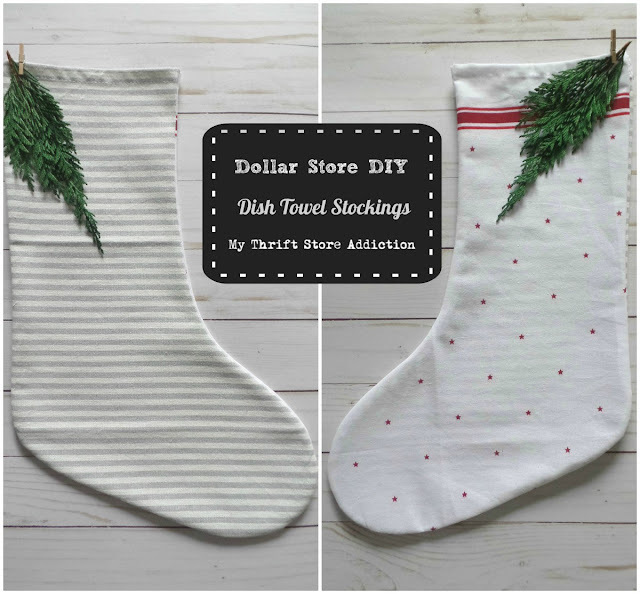 Can you believe these farmhouse style stockings are repurposed from dollar store dish towels? To make your own stockings, click here! 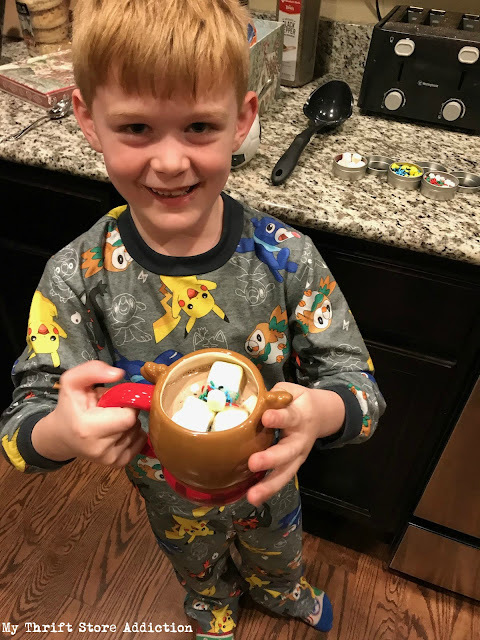 Last year when I scored this cute reindeer cup that still had the tags on it and had never been used at the thrift store, I knew Ginger Grand would love it and I was inspired to create this simple cocoa bar in a cup as gift for him. 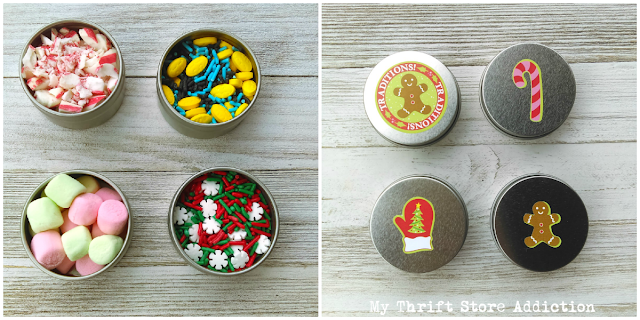 I used these dollar store tins to tuck inside favorite cocoa sprinkles! Think he liked it? You be the judge! To create your own cocoa bar in a cup, look here! Here's another fun project for Littles that also involves reindeer. 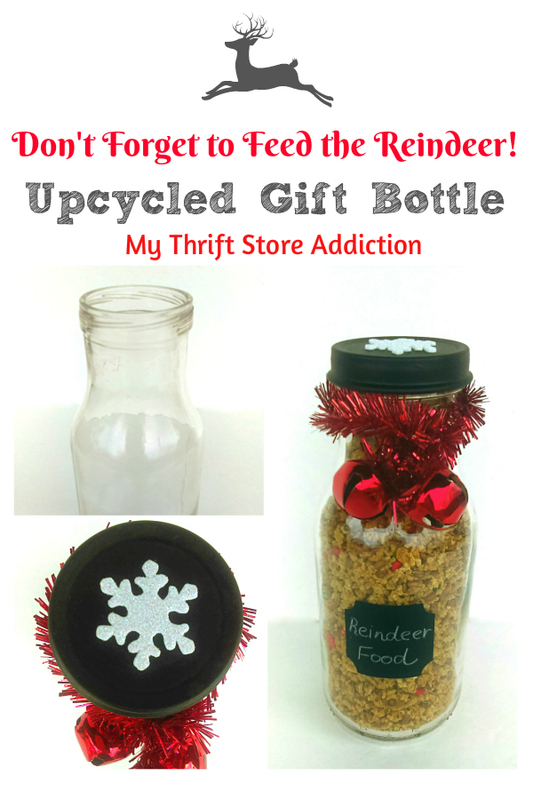 Upcycle a bottle to decorate for DIY reindeer food. I've given this gift to several little ones and it was a big hit! Look here, for my easy reindeer food recipe! If you're like me, and collect floral frogs, why not stack several to create a repurposed Christmas tree? 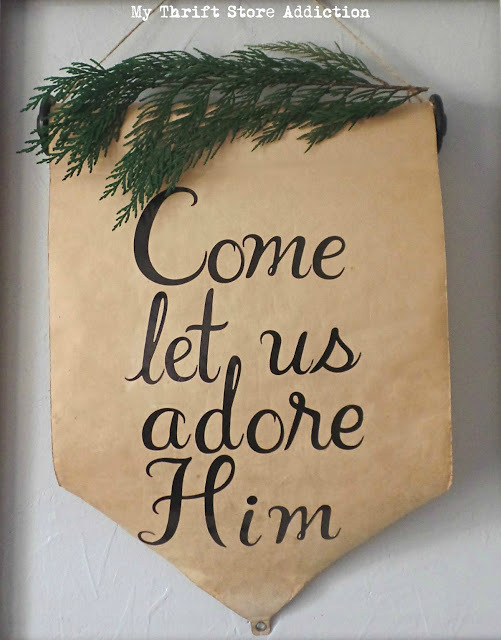 You'll be surprised to learn what vintage thrift store find I repurposed to create this vintage farmhouse Christmas sign! To make this miniature diorama, I combined a few yard sale and thrift store finds and raided my craft stash. 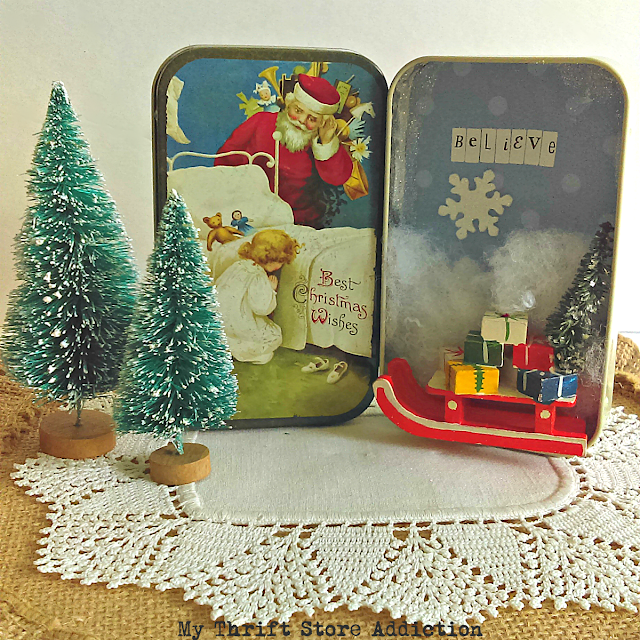 Make your own Upcycled Christmas Tin Diorama, here! 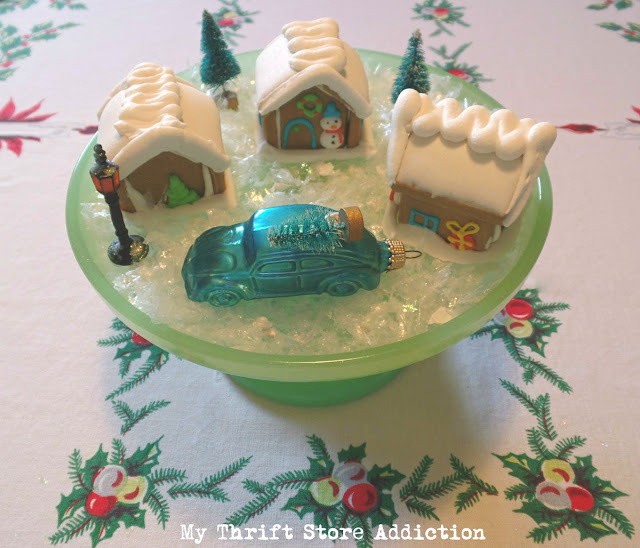 This jello mold project has been one of my most pinned and readers' favorites. 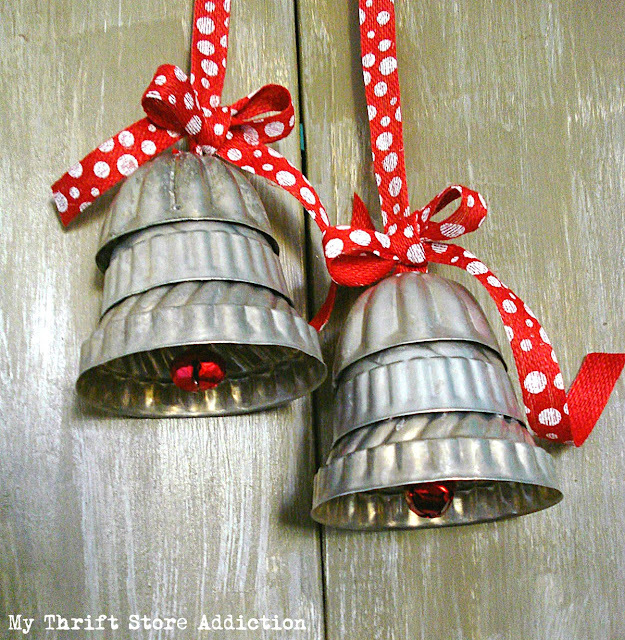 Create your own silver bells, here! When I spied these tiny gingerbread houses at Dollar Tree, I fell in love! Arrange them on a cake stand, add some faux snow, bottle brush trees and a matchbox car or truck and you've created a mini village! Find more mini gingerbread house village details, here! 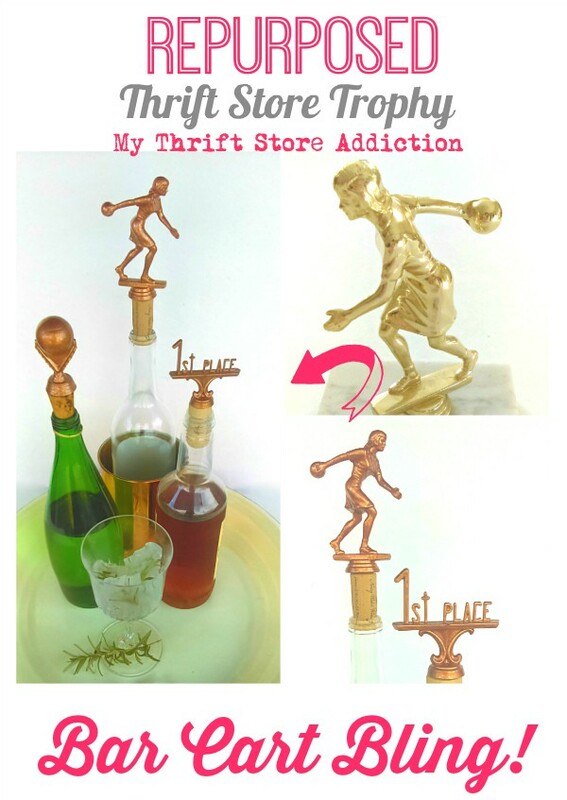 How many times have you seen old trophies at thrift stores or yard sales? Here's a fun project for your holiday bar cart. Click here, to make your own bar cart bling! 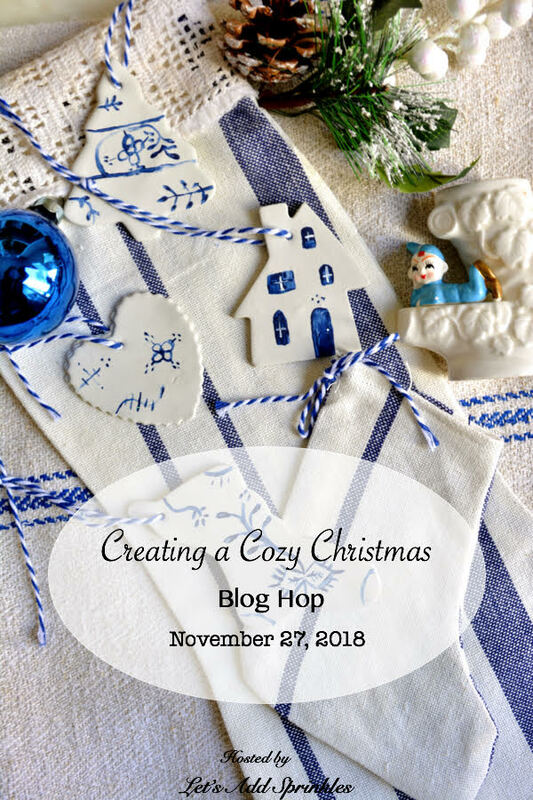 ...and be sure to visit the rest of these creative bloggers for more cozy Christmas inspiration! These all are great ideas! So many great ideas Cecilia! I think I first found you when I spied so glorious bells. Keep cozy! I love making things out of dish towels. You scoured some cute ones at the Dollar Store. My favorite is the bells. Those are just too precious. Thanks for joining our Cozy Christmas Blog Hop. Ceclia, these are all wonderful ideas! 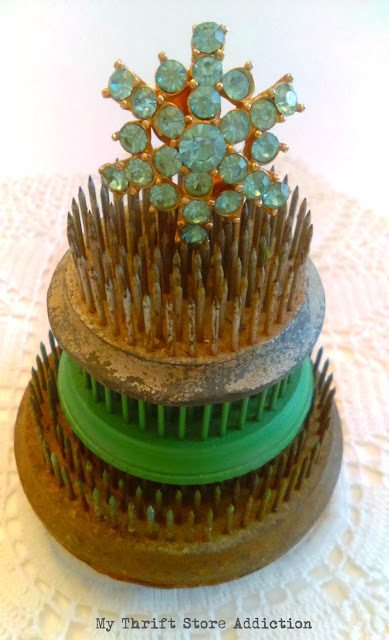 I'm pinning a few to put on my Christmas "to do" list as they will make great gifts! Have a great one! Hugs! Cecilia, you are so clever. These are some good ideas. Thanks for sharing with us. 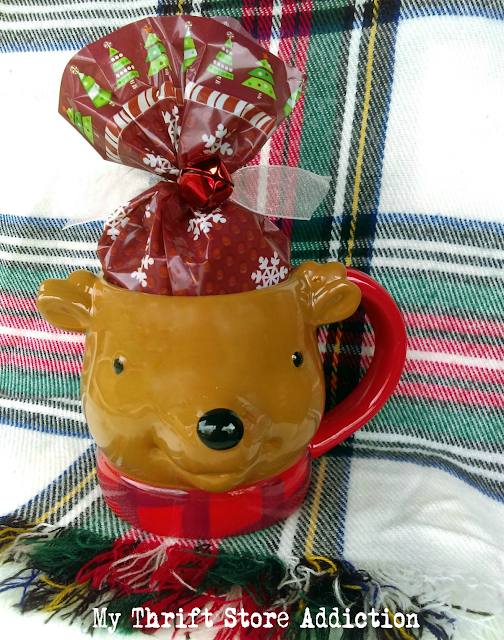 Love that cute reindeer mug! Happy Holidays! Cecilia, You know I love DIY and you have outdone yourself. The sign on the craft paper is my favorite ~ you know I would have used stencils and ChalkArt from A Maker's Studio, but the stickers were a great find. THe dish towels are also super fun ~ they are so versatile. Wowza, you are one clever girl! I love every single idea and would never have thought to do any of them! I'm on the hunt now for some jello molds so I can make those bells. So perfectly Christmas! Such great ideas, Cecilia. Your ginger boy is absolutely adorable. Yes, I think he loved your tins of sprinkles! Those. Stockings. They are just charming. I love your paper roll sign. So much creativity in one post! 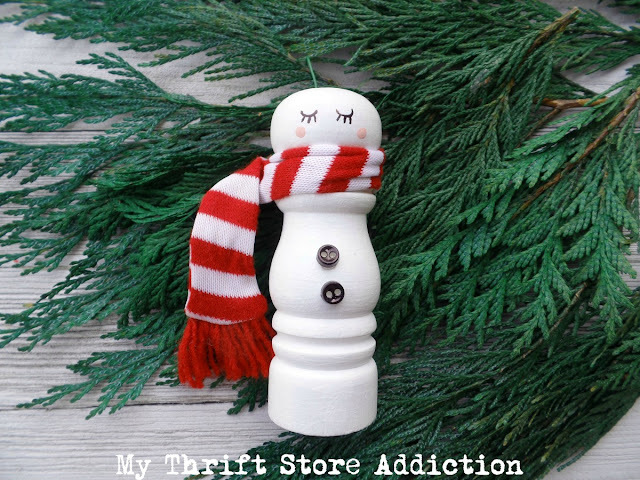 Oh my goodness, that salt shaker snowman?? I need one...immediately!! Too darling! Oh wow so many fabulous ideas! I also made a flower frog tree this year. The dish towel stockings are wonderful. I just bought a sewing machine so hopefully by next year I will be able to make my own. I see cute dish towels all the time. Great post! I also love the Pokemon pj's! Brings back so many memories. My 25 year-old was Pokemon crazy when he was little and then we went through another round of Pokemon with my 13 year old. Actually they both still love Pokemon! So happy to be hopping with you this week!